Published Apr 9, 2009 by Que. Part of the LiveLessons series. Have you ever recorded a macro? How did that work for you? Did it work the next day when you had more records or fewer records? The answer is probably "No" and here's why. The macro recorder starts with one very annoying default setting. If Microsoft would change this default, people would have much better success with the macro recorder. In these seven lessons, Bill Jelen will show you how to change that setting, which tools to completely avoid, and workarounds so that you can get useful code. Join Bill Jelen as you take a look at the Visual Basic editor in Microsoft Excel 2007. The editor will check your code, as you write it. It provides context sensitive help and even has a 400-page guide to every property, method, and object; plus it has great debugging tools. Learn how to set up the Excel Window and the VBA Window and you can watch your code line by line. Breakpoints are also discussed. These lessons are devised to get you up to speed so you can look at object-oriented code and understand it. They will also introduce the first concept the macro recorder will never do, which is using variables. This is a critical concept if you are dealing with datasets with a different number of rows every day. You'll then learn how to use those variables to refer to cells. You'll learn to stop using the Range object and start using the Cells object, which is much more flexible. Life is all about decisions, and VBA requires lots of decisions, too. Do we include these records in this report? Do we pay a bonus to this region this month? How do we classify this revenue by product line? In these three lessons, you'll learn the basic If Then logic as well as tricks for more flexible ways to make decisions such as If Then Else and Select Case. Writing code is a way to automate a redundant task. Looping is a way to run your code over and over and over again. You can repeat the code for every worksheet in the workbook, every product in the catalog, every city in the country, or even every row in the worksheet - and that is 1.1 million rows now! With a loop, write the code once and have Excel run the code over and over. This is where the power of VBA really shines through. In these lessons you're going to learn about the basic For Next Loop as well as some other basic loops from Pascal. You will also learn about the new object-oriented loop call For Each. These lessons will instruct you how to take data to multiple worksheets or multiple workbooks. It will also show you how to construct those worksheets or workbooks on the fly. Watch how to split a large dataset to create one workbook for, say, every customer. Then see the opposite, you'll take every single workbook in a folder and bring them back into one large worksheet. Can you say, "Budget rollups"? This set of lessons begins with discussion of the A1-style formulas that everyone knows and loves but moves quickly onto an R1C1-style formula that works better with VBA. You will also take a look at how to take Excel's built-in functions and use them in your VBA code, or how you can write new code in VBA to create new functions that can be used in your worksheet. These lessons cover the powerful tools in Excel and how to do those with VBA. You'll cover charts, filters, and pivot tables. You'll also discover a new power tool that is exclusive to VBA called an Event Handler Macro. These amazing tiny little macros will run in response to various events in Excel like selecting a new worksheet or even selecting a new cell. They are amazing and you've got to check them out! Let's face it, you started writing VBA in order to get rid of those annoying, redundant jobs, right? Let's really get rid of them and have someone else run your code. In these lessons, you'll learn how to interact with a person running your code. How to ask questions. How to report status. And, if something unexpected happens, how to provide a soft landing for that error, tell them what went wrong, and who they can call to solve the problem. Finally you'll see how to run your macros in half the time. Think about setting up a dual-workbook system - one workbook has all the data; the other workbook has all the code. When you get to the point where you are sending your macros out to be run by everyone in the sales force; this technique will save you months of headaches. You'll cover separating code and data, as well as cleaning recorded code. Excel VBA and Macros with MrExcel delivers the power of the best classroom training at a small fraction of the cost. If you don’t have time to read a huge book on Excel macros and scripting, this is exactly what you’ve been searching for! 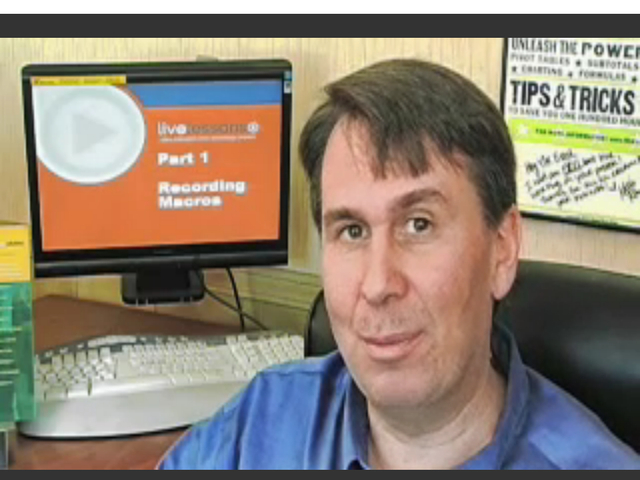 LiveLessons are video courses are organized into bite-sized, self-contained sessions–you’ll learn key skills in as little as fifteen minutes! Bill Jelen, known worldwide as MrExcel, presents live Excel seminars across the United States and appears in over 800 podcast episodes. His 20 Excel books include Special Edition Using Excel 2007 and VBA and Macros for Microsoft Excel. His website, MrExcel.com, answers 30,000 Excel questions per year.